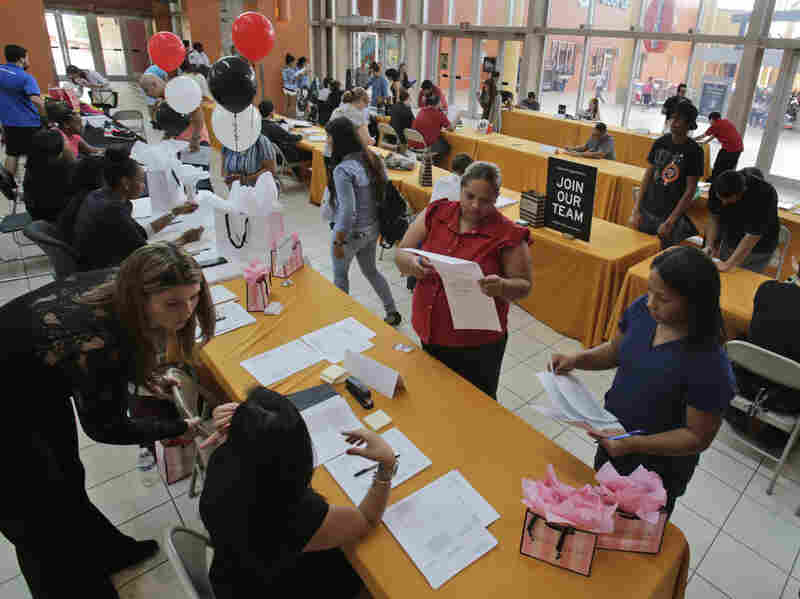 Unemployment May Be Dropping, But It's Still Twice As High For Blacks The jobless rate fell is at an eight-year low, the government reported today. But for blacks, the rate is still 8.8 percent — a bit lower than worst unemployment whites experienced in the recession. The jobs numbers are in: 150,000 jobs were added to the economy in January. That's fewer than expected, though the unemployment rate fell to an eight-year low. President Obama took the opportunity this morning to take a shot at some of his more vocal opponents. "The United States of America, right now, has strongest, most durable economy in the world," he said. "I know that's still inconvenient for GOP stump speeches, as their 'Doom And Despair' tour plays in New Hampshire — I guess you cannot please everybody." There was a lot of good news in the report: It wasn't just hours worked that went up, pay went up too — and that hasn't happened in years. But those things aren't true for everyone. "One of the problems is that we continue to have a tale of two economies," says Imara Jones is a economist and writer. "[The improvement] is mostly true for people who are white, have good educations, and are tied to those sectors that are flourishing in the global economy. And then we have the economy of everyone else that has been left out and left behind"
People attend a job fair in October, 2015, at Dolphin Mall in Miami. One of the groups left behind is African-Americans. Their unemployment rate, 8.8 percent, is more than double the rate for whites, 4.3 percent, and is actually closer to the 9 percent unemployment rates whites experienced in the depths of the recession. And for blacks, the rate actually went up last month. Lowell Blackmon, 20, is working on getting a GED — and on getting a job. "Right now, any type of job that, you know — that can pay me," he says. "I'm good with my hands, so I like to work a lot. They got a lot of jobs out here, you just gotta have your stuff to be able to do it." Valerie Wilson, an economist with the Economic Policy Institute, says part of the reason the unemployment rate for blacks may have gone up is because more were looking for work. "Perhaps people who were previously unemployed were encouraged by last month's numbers and are now looking for employment," she says, adding that while there's good news for everyone in this months' report, "we still maintain that roughly 2-to-1 ratio between black and white unemployment." "That disparity is very persistent," Wilson says, "and it's present whether we're in a recession or in a recovery. It's present at all levels of education." Gwendolyn Cole hopes she's one of the workers headed in the right direction — she's been out of a job for two years, but just got an interview with the utility company Pepco. "I'm so happy about it, 'cause I did 15 years with D.C. Public Schools, and then I turned around and did 15 years as home child care provider," she says. "So I went into electronics, and it's a wonderful field, because it's more data entry, customer service." Cole's work history shows why many African-Americans are struggling to make their way out of the last recession, says Imara Jones. African-Americans are more likely to be teachers and firefighters and police than their white counterparts — in part because of the strong anti-discrimination laws that exist for government jobs that you don't have in the private sector," he says. "And of course during the Great Recession, one of the greatest lagging sectors in jobs was that — in government." Jones says though there is a still a lot of good news, but a lot of people especially African-Americans — don't feel like they're benefiting from it yet. "Once you have labor force participation going up, unemployment coming down, wages going up and hours going up, that's the sign of a recovery — but we're not there yet," he says. But economists Jones and Wilson do say we're getting closer — one little step at a time. In the audio of this story, as in a prevous Web version, we misidentify economist Valerie Wilson as Valerie Johnson.